Stored Procedures are faster as compared to LINQ query and they can take the full advantage of SQL features. The following data table will be used to show how stored procedure work with your application. Here in the above tables all the fields are kept non nullable and the Identity Specification for the primary keys are auto incremented by 1 as shown below. Before creating your first procedure let's have some introduction about naming convention and format. Since default database procedures uses sp_Procedure_Name as their naming convention so we will use it little bit differently to separate our procedures. We will use usp_ProcedureName as our user defined procedure. To pass a parameter in the procedure we have to use "@" sign before that parameter name and then declare its data type as given in the corresponding table. Below is a sample of how to create a procedure. To create a procedure go to UniversityDB > Programmability > Stored Procedure as shown below. Then right click to Stored Procedure folder and then click to Stored Procedure.... A script window will open as shown below and then all you need to do is write your desired procedure. Just change the abobe default structure as below which is created to save student data (as a single object). After writing the below script just execute your script and you are good to go. Hey! your first procedure has been created. You will find all the user defined procedures in Stored Procedure folder. Below are the Save, Update, Delete, and Select procedure for single data object. To save list data by stored procedure we need to create user defined table (not the actual database table, just a replica) first. After creating new data type we have to use that data type for the parameter we pass through procedure. In this part we will create procedure to save list of data to the database by stored procedure. At first we will pass a XML data string to the procedure and then a Data Table from which INSERT query will save all the data. For now these are the database elements we need to create our application. Some points will be described in the code when description needed to relate the database variables with the C# variables and code. Then go to Tools > Library Package Manager > Manage NuGet Packages for Solution and add/update Bootstrap, jQuery, angularJS, and Microsoft ASP.NET MVC packages. Build your project for any error. Now as your project has been successfully built, right click to Views folder and add a folder named Layout. 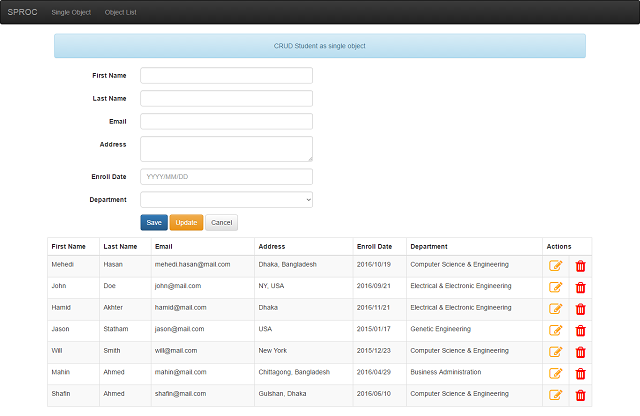 Then add a MVC 5 Layout Page (Razor) and name it _LayoutPage. Then add the required designs, styles, and scripts as done in the demo porject attached in this article. In this part we will add a database model to the project. Right click in your Models folder and add an ADO .NET Entity Data Model and name it SprocModel. Then follow the instructions to add your UniversityDB database to the project. We set the entity name as SprocEntities here. Add a controller (MVC 5 Controller - Empty) by right clicking in Controller forlder and name it HomeController. Then add the following references and actions to HomeController. Make sure these references are there in your HomeController namespace section. Create your entity instance before creating actions. Then create these two Views for single object and object list page. In the following action we will convert the student list students as XML file and then send it to the procedure usp_SaveStudentListFromXml as a XML string. Here we will convert the same student list students to DataTable and then send it to procedure usp_GetAllStudentData as a Sql Parameter. Carefully follow how the parameter is created and different values of that parameter is set. Now since all required actions have been created to HomeController we need to add two script files for the two views Index.cshtml and ListObject.cshtml. Name those files as singleObject.js and listObject.js respectively and then add the references of these files to your Index.cshtml and ListObject.cshtml Views. Right click in your Scripts folder and add a folder in it named CustomScripts and then create the following script files in CustomScripts folder. Make sure you know the basics of angularJS and how to make CRUD operations with it. In the above script files I have created the department list as a static list. You can fetch it from database as well. Since I have attached the demo project file with this article so I will not give the html page markups here. Rather below are the screenshots of the two pages we need to work with. 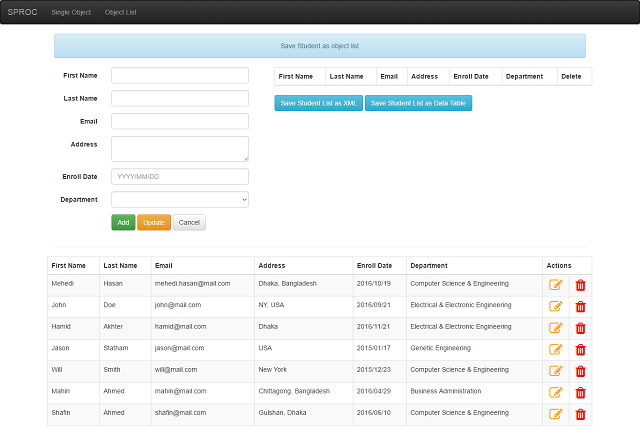 In the above form fill all the fields and click Save button to save the student data. Click Edit icon under Action heading to edit the data, and after editing the data click the Update button to update it. Trash icon will delete the student object. Here after filling all the fields click Add button to add that student data to the right side table. You can add as much students as you want. After adding all the students to the table click Save Student List as XML to save the students list as XML data or click Save Student List as Data Table to save the list as Data Table. Here in the second table (placed below the form) Edit & Trash icon will do the same as described for previous page. This article will mainly help the beginners and also the intermediate level developers who really like Stored Procedure and facing problem to work with list data in Stored Procedure. Many would prefer LINQ over Stored Procedure as I am (since less code required) but still Stored Procedure is a good choice for performance and security as we know. Hope this article will help you in the best ways. Discussions on SQL Transactions will be added as soon as possible with this article. Demo application file missing and download problem has been solved as per feedback. Have a look. Worked on ASP.NET MVC, AngularJS, jQuery, T-SQL, LINQ, Kendo UI, SQL Server, Bootstrap. Working on web based application development and fully concentrated on both client side and server side programming. Hey download links are broken. Hi missing both zip files, can you please just post the code in the article instead since the zip files keep getting deleted, might be system checker thinking its a virus. It is a well written article and throughly explained. But, the files are missing, since when I try to download it, it gives following error please check. Error:	An error occurred in this page. The error has been recorded and the site administrator informed. Would you please post again the files??? Which files are missing? Please try to point out the files so that I can re upload them. If demo project has some errors then state it & I will check and update it. Thanks by the way for your findings. Please upload all files. They are missing. Application re uploaded. Please check the files. Thank you. Please reupload all files. They are missing again.